CLICK HERE TO VIEW PAST RESULTS! FOR PAST RESULTS, CLICK HERE! Interested in hosting a future event? There are two sections in the tournament that all Washington students in grades 6-12 are eligible for, whether they have participated in a league or not: The Open team and Individual sections. VARSITY Teams may be formed of students who attend school or reside in Oregon high schools, grades 9-12. One team per high school allowed. JUNIOR VARSITY Teams may be formed of students who attend school or reside in Oregon schools, grades 6-12. One team per high school allowed. Teams made entirely of middle school students may also register to play in this section. INDIVIDUAL Open to Oregon and Washington students grades 6-12. OPEN Teams may be formed by any group of students who attend school or reside in Oregon or Washington, grades 6-12. 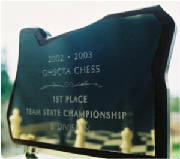 Titles Awarded: State High School chess team titles will be awarded in the Varsity and JV sections to the overall section winner (overall state champion) and according to OSAA Classification (top score amongst 6A teams, top score amongst 5A teams, etc.). SECTION RATINGS & SEEDING Each player on the team will be assigned a rating based on their highest established rating in the NWSRS and USCF. If both are established or neither is established, we will assign the higher of the two. If a player is not rated in either system, they will be considered unrated and receive a rating per NWSRS guidelines of 100 points per grade (example - grade 10 = 1000 rating on unrated players). For purposes of pairing/seeding, the team's average rating will be used. Absolutely no unregistered teams will be accepted at the door. Knowing who is coming beforehand is key to ensuring we start on time. Coaches must bring the certification letter from their school (no exceptions) with all players listed or they will not be allowed to play. All teams must present their first round lineup via email by midnight Wednesday, March 1st. Teams who fail to present their first round lineup will forfeit their first round, unless prior arrangements are made with the Executive Director. Last minute changes may not be approved due to time schedule. Individuals will play on the same schedule as teams. Provided you have already submitted your online registration form, instead of mailing your check and the authorization letter to the treasurer, you may bring it to the tournament. But remember, to receive the early registration discount, we need to have your registration form submitted by Feb 17th. Also, all registrations must be made no later than Wednesday, March 1st--no onsite registrations are allowed. REQUIRED INFORMATION ON TOURNAMENT DAY: School contact info, coach contact info, team roster (for every team), team captain names, signed letter of certification on school letterhead from your superintendent, principal or athletic director listing each player by name and their qualification (see bylaws for additional information). You must have this information with you in order to play in the Varsity or JV Division.